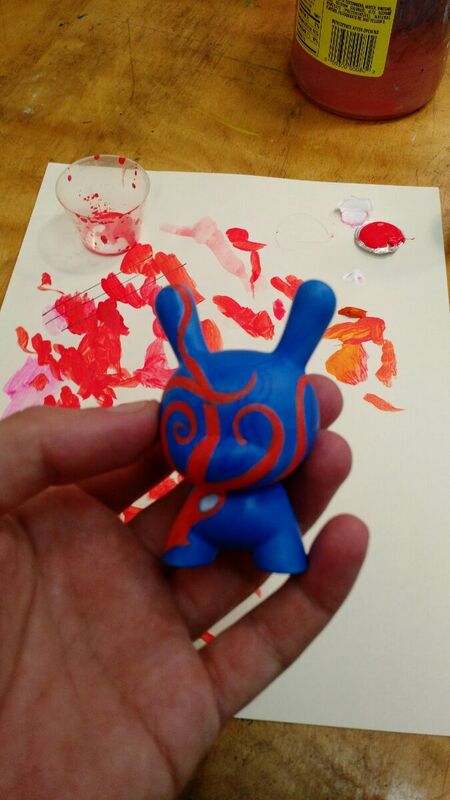 I recently finished a comissioned custom painted 3-inch Kidrobot Dunny figure for a collector. He liked a concept design that I had posted online from 2005 and asked if I would be willing to put it on an actual figure. It was a great opportunity to see if the squid concept would work on an actual three dimensional figure. I think it turned out pretty good. Below are some process photos and a brief explanation of the steps involved in making this figure. The original plan was for a production 3" Dunny. That means the art could be a bit more detailed that a hand-painted design. I managed to get most of the details on the hand painted version but there are a few small alterations in detail and color choice. I guess 3" Dunnys don't come blank any more (maybe they never did). Anyway, to get a blank canvas to start from, I had to sacrifice an existing design. 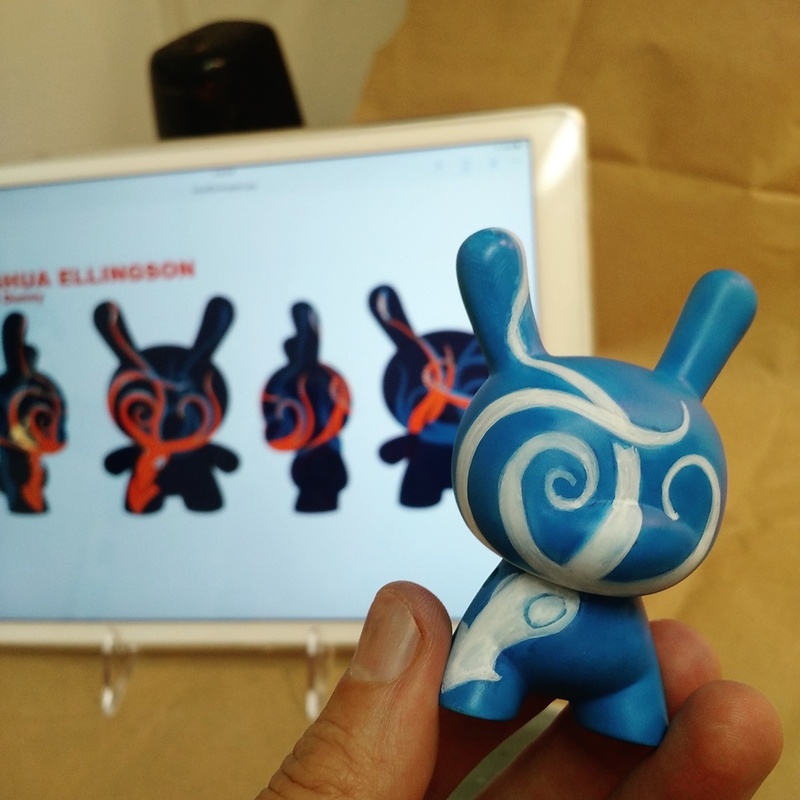 I found a MISHKA blind box Dunny on-sale at Amazon so I started from that. I'd read that acetone works well to strip the designs of vinyl toys but I don't recommend it. It sort of worked but then I tried regular old lacquer thinner and it just came off immediately. So, if you do this, use lacquer thinner. I knew that I wanted to work with acrylic paint for this project. Acrylic works really well with vinyl, so I didn't have to do much priming. I also knew that I wanted to start with a flat blue because that is a common color for most of the surface. So, I airbrushed a layer of middle blue onto the whole figure. The airbrushing also gives the figure a nice texture to paint onto. The color goes on flat, but there is a little tooth from all the misted-on paint for the next layers to grip on to. Then, I sketched the design freehand onto the blue figure with pencil. This gave me an idea of how the final art would wrap around the Dunny. Then, I painted the sketch white, so that a future layer of orange would stand out better. I used a small, round, synthetic sable brush and liquid acrylics to paint the figure. Soft brushes and thin paint help keep the design smooth and tight to the surface. I started with the neon red/orange squid color. After that, I applied a darker layer of blue to areas not covered in tentacles. After that, it was just a matter of layering to reduce brush strokes, add detail, and fix mistakes. In the end. I'm pretty happy with the way it came out. I was surprised that the design worked so well on a small figure. I thought maybe it would be too detailed but I think it turned out fine. Working in three dimensions is always a learning experience and a fun challenge. It makes me want to break out the paints more often and start painting more toys.